A month long reality TV series was recently produced by Norway’s largest newspaper, Aftenposten, in which popular fashion blogger, Anniken Jørgensen, and avid consumers, Frida Ottesen and Ludvig Hambro, were taken on a surprise trip to Cambodia to work in the sweat shops that produce the clothes they wear and flaunt online. The trio were caught off guard when they arrived in Phnom Penh, Cambodia, unaware that the premise of the show involved turning them into poster-children of the comparison between Western excess and crippling economic injustice. Needless to say, the trio didn’t last long in the horrifying living and working conditions harboured by the Cambodian garment industry. According to human-rights advocacy group, Clean Clothes, over 500,000 workers face oppressive working conditions, clocking six full-day work weeks to bring home $100 a month—less than most Westerners make in a day. “The truth is, that we are rich because they’re poor,” says Hambro. The trio were caught off guard that the premise of the show involved using them to contrast Western excess and crippling economic injustice. In episode five of the series, Jørgensen interviews a 19-year-old worker who explains that her mother died from starvation because they did not even make enough money to eat. “We were so poor that we did not even have rice,” explains the young Cambodian woman. Though Cambodia’s maternal mortality ratio has steadily declined over the last few decades, “from 472 per 100,000 live births in 2005 to 206 per 100,000 live births in 2010,” malnutrition, especially concerned with the quality of food, represents “60.4% of all childhood mortality in Cambodia,” according to an article in the Asia Pacific Journal of Clinical Nutrition. The factories that contain these workers are equally neglected, both the buildings and workers occasionally collapsing under a lack of support. The buildings are rebuilt to maintain production. The workers who have died in the rubble are replaced as well. Their duties consist of monotonous 12 -14 hour days, earning $3 a day before returning to a concrete floor at night to rest between shifts. “One girl told us she had sewed each side of a sweater together, the same seam, for 14 years.” Says Jørgensen. H&M is an example of a company that relies on cheap labour in Cambodia for their production. 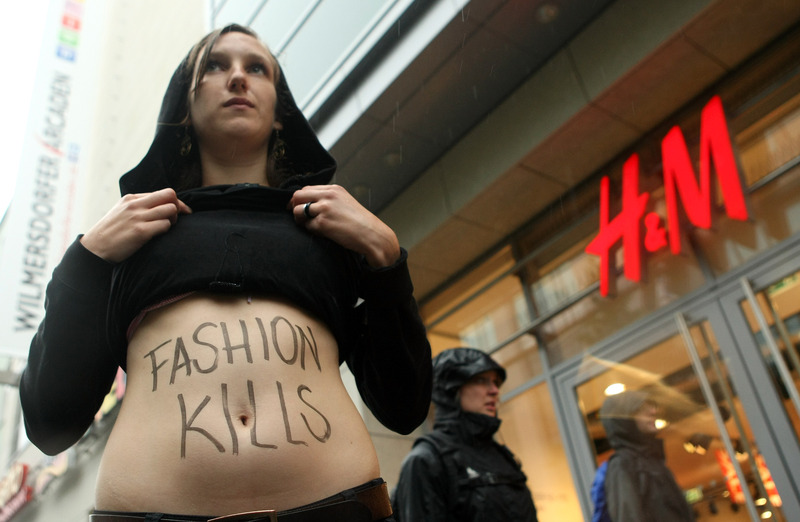 The TV series, SweatShop Deadly Fashion, attempted to contact H&M to discuss their action plan in addressing this issue, who refused to be interviewed. At least they’re honest—on their website, it states, “Everyone who’s employed by the fashion industry should earn enough to live on—whoever they are and wherever they work. Unfortunately, this is not the case in many of the countries that we rely on for garment production.” The company has allegedly developed a “roadmap” for achieving fair wages, which began in 2013 and will be in place by 2018. Yesterday, Clean Clothes called out H&M to show evidence of their movement towards fair living wages, in response to the companies sustainability report that does a great job of talking up the company with flashy animations while eluding hard numbers. “Making marketing capital from workers’ poverty with little evidence of change is unethical and stands to slow down progress in the industry.” Reads a statement on Clean Clothes website. Jørgensen continues to blog about fashion, but the connotation has changed. “I often try to find clothes that can be used with good conscience.” Reads yesterday’s post on her website. H&M’s fast-fashion production system is reliant on low-wage production in some of the poorest countries across the globe.